Organizations that aggressively digitize their supply chains can reduce procurement costs by 20 percent, cut supply chain costs by 50 percent and increase revenue by 10 percent, according to recent Center for Global Enterprise research (CGE)). And according to PwC, companies with highly digitized supply chains and operations can expect efficiency gains of 4.1 percent annually, and revenue upticks of nearly three percent annually. On an enterprise scale, these are numbers carry heft – translating into millions of dollars in added profit. They make the C-suite sit up and take notice. Welcome to the world of Supply Chain 4.0. 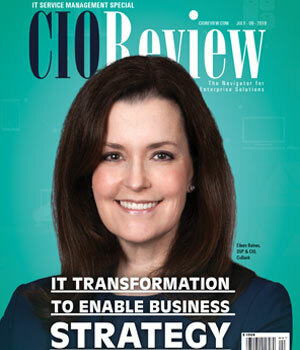 Thanks to new offerings in technology and platforms, supply chain has re-awakened. It is racing headlong into its next wave of digital transformation, which we call Supply Chain 4.0. What is Supply Chain 4.0 and what impact is it having on companies that embrace it? Before answering these questions, let’s look at some background. Supply chain is no stranger to technology adoption. 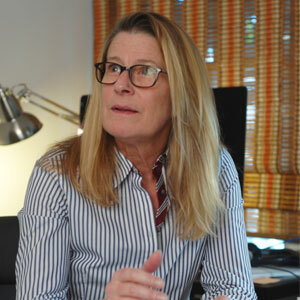 In the past, though, supply chains tended to embrace point solutions – e.g., warehouse and transportation management solutions, inventory optimization systems, network design solutions – all of which operated in siloes, with hard-and-fast walls separating them from each other and from ERP or other enterprise systems. Gaining true, holistic, actionable business insight from these disconnected point solutions was challenging, to put it mildly. Spreadsheets became the de facto “glue” that connected these disparate outputs. In fact, even today, spreadsheets remain the ‘go to’ tool companies use to link up supply chain outputs with the rest of the organization – sales, manufacturing, marketing, finance, etc. A 2017 survey on big data analytics adoption in supply chain, conducted by a joint academic-industry group, found that despite all the new analytics capabilities and platforms, spreadsheets still rule the day when it comes to managing supply chain operations. With supply chain organizations struggling to prove their equal need for investment in digitalization, other areas had no such problems. Companies readily spent upgrade money on more visible ‘front-end’ solutions that directly touched the customer. But leading organizations now know this is not a workable strategy. Without a robust, smart ‘back end’ (supply chain), companies cannot execute on the front end. As a result, they are now investing in new, smart supply chain applications and platforms, at a record rate, as the 2017 big data analytics survey found (Figure 1). This investment is making a difference – it is transforming supply chains. Smart applications and platforms like big data analytics (all forms), artificial intelligence, cloud computing, collaborative workflow engines, smart control towers with visualization, intelligent sensors, and blockchain are fueling a new era of supply chain innovation that directly drives profitability and performance. Figure 2 lists some of the key elements of the new digital supply chain. Together, these new big data applications and platforms collect data from disparate, siloed sources from inside and outside an organization, cleanse it, and for the first time, aggregate it into a “single version of the truth” of what is actually going on in the supply chain. They then apply smart analytics to develop actionable insights on which to make strategic and operational decisions. Companies go through stages of maturity as they implement next-generation supply chain technologies. How and where they are in this maturity continuum offers a good indicator of their potential to drive digitalization-derived profitability. Digitalization occurs in five stages – or levels - on a maturity ladder. This ladder starts at level 1, with descriptive analytics. It moves all the way up to level 5, which uses highly sophisticated AI and decision-making algorithms to operate the supply chain. This digitalization incorporates both “soft” and “hard” technologies – e.g., everything from big data analytics and Internet of Things (IoT) sensors, all combining to create the end-to-end digitized supply chain. 5. Cognitive—uses machine learning and artificial intelligence to automate decision-making based on pre-approved parameters and correlating execution algorithms. What’s driving this rush toward Supply Chain 4.0? Many factors, but the biggest by far is what we call the “Amazon Effect”. Amazon is a disrupter of near-mythic proportions. Amazon has not just reinvented retail, it has reinvented customer service, product availability and pricing, and the requirements for the supply chain itself. Amazon has become the “bar” against which all companies are now measured by their customers. Whether they like it or not, every company must have an “Amazon Strategy”. Companies must not only perform impeccably but do so in the face of continually intensifying cost and profit-generation pressures. Traditional competitive strategies based on combining market research, sales projections and cost cutting initiatives will not work. Operating with only generalized profit information, such as a profit and loss (P&L) statement, is not sufficient. Such generalized metrics lack the granularity required to go on the offensive. Therefore, companies must develop strategies that are based on specific performance insights on products, customers and channels. 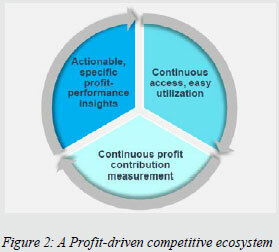 • The ability to measure and modify strategies based on their actual and specific profit contribution impact. Source: Lisa Harrington, Richard Sharpe, “Tackling the Amazon Effect: Time for Offense,” 2017. In addition to the above broad-scale analytics technologies, several individual digitalization technologies are worth discussing. Second only to big data, blockchain is the topic of the moment in supply chain. You can’t pick up a supply chain publication without reading about blockchain. But what is blockchain in supply chain and why should we care about it? Simply defined, blockchain is a tamper-proof distributed database that holds records of everything that occurs in a supply chain – all the transactions that occur in moving goods from point of production to end user. The key emphasis here is that the ‘records’ – ledger entries – cannot be tampered with or altered once they are entered. This creates an information chain of custody – much like an evidence chain of custody in a crime investigation – for managing activities and actors in the supply chain. 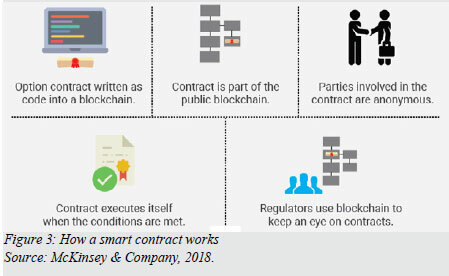 One of the key enablers of a supply chain blockchain – the mechanism for getting business done – is the smart contract. The two technologies are inextricably linked and feed one another. Parties to a smart contract agree on the terms, post them, and layer on artificial intelligence and decision-making parameters that trigger actions, without human intervention. For example, if a truck delivers a shipment, and the delivery meets all of the conditions of the arrangement, the smart contract automatically triggers payment to the carrier. No invoicing. No administrative (human) intervention or processing. No “back room” of invoicing and invoice resolution clerks. • A single, immutable version of the truth about what’s happening in the supply chain. • Reduced administrative burden - eliminates manual processing of invoices, reduces errors, resolves discrepancies, etc. • Captures IoT data feeds on product condition, location and other parameters that verify product security and integrity. 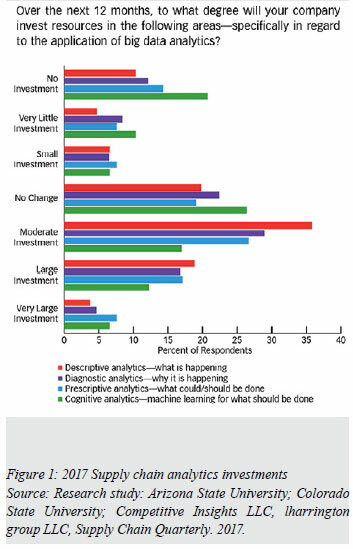 Most companies are still in the early stages of implementing analytics/informational technologies. 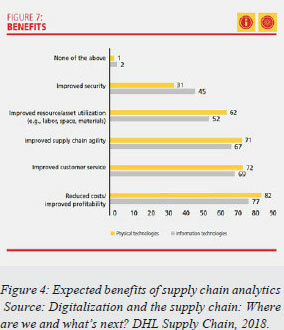 But they expect big benefits, as a recent DHL Supply Chain research study shows (Figure 4). • 69 percent anticipate improvements in customer service. In an increasingly service-driven, e-commerce-like supply chain world, that combination of benefits makes investing in supply chain analytics essential.